"This is a scrumptious, filling Mexican dish that is easy and loved by everyone I've served it to. Lots of flavor and a spicy kick of chiles and pepperjack cheese will make this a family staple any night of the week." Cook and stir ground beef and onions in a large skillet over medium-high heat until meat is browned and crumbly, 7 to 10 minutes. Add garlic and cook until fragrant, about 30 seconds. Stir in diced tomatoes, green chiles, cilantro, and taco seasoning mix. Remove from heat. Mix black beans and 1 can red enchilada sauce in a bowl until creamy. Mix pepperjack cheese and Monterey Jack cheese together in a separate bowl. Heat a cast-iron skillet over medium heat. Cook tortillas, one at a time, until slightly crisp, about 15 seconds per side. Place one tortilla on the bottom of an 8-inch springform pan. 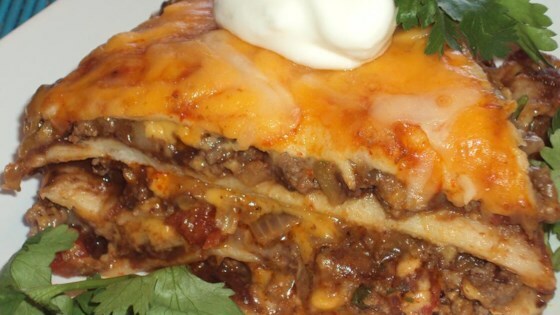 Spread a generous layer of black bean mixture on top of tortilla, then spread a layer of ground beef mixture on top. Sprinkle 1 cup of cheese mixture on top of meat mixture and pour 1/4 cup red enchilada sauce over the top. Repeat the tortilla, bean, meat, cheese, and sauce layering process, finishing with cheese and enchilada sauce on top. Cover pan with aluminum foil and bake in the preheated oven until cheese is bubbling and enchiladas are cooked through, about 40 minutes. Cool for 15 minutes and serve with sour cream. If the spicy flavor is too much, substitute Monterey Jack cheese for pepperjack cheese and use mild enchilada sauce. This was fantastic... and the left overs I swear were even better. I made some changes only because i didn't have some items. But i would make as is. Tastes fantastic, but too much ingredients - overflowed the pan and could only use 4 tortillas.